No one's perfect, so of course, no gift is perfect either. Many of us have received gifts that have been memorable for all the wrong reasons. It's easy to make gift-giving mistakes even with something more general than a golf product, but luckily, it's just as easy to avoid making them in the first place. Personalized gifts can be very special, but be careful to get the spelling of the recipient's name right. If the recipient has a name which may be commonly misspelled or with common variations on the spelling, the person has probably seen his share of misspellings come through the mail. So if you're going to go through the trouble of giving someone personalized golf balls, it's best to make very sure you get their name right. Messages should also be completely accurate and if it's meant to last for years, not too dated. 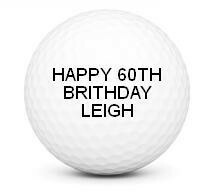 A box of one dozen Callaway Chrome Soft balls labeled "Happy 60th Brithday Leigh" is not the best gift to give to a 50-year old golfer named "Lee." One of the most common reasons why someone would return or exchange a clothing or apparel gift is that it's the wrong size. Our size charts try to give you the most accurate size possible, but there's no guarantee that it will fit perfectly. Be sure of your golfer's size before ordering, whether it's for apparel or shoes. He may love what you've given him, but exchanging it adds unnecessary time that could be spent actually enjoying the gift. Many golfers are brand loyalists. If a guy has been buying only Taylormade clubs for thirty years, it's unlikely that he'll want to unwrap a set of Callaway clubs. To avoid committing this faux pas, try to figure out if the recipient is one of these brand loyalists. If his bag, clubs, and hat all say TaylorMade on them, there's probably little reason to try to buck that trend now. This one is similar to the Wrong Brand mistake, but possibly worse, considering how crazy people get over their sports teams. If you don't know for sure what team your golfer roots for (or if they have a team at all! ), you should probably avoid team golf gear altogether. Novelty products can be either be loved or hated depending on their relevance to their recipients. A golfer who has never expressed any interest in Looney Tunes may be confused if he receives a Bugs Bunny headcover. Unless there's an inside joke or you know your golfer is a big fan of a certain character or animal, it's best to stay away from giving him such a specific product. This is a mistake that usually affects just one gender. Many golf products marketed to men can be used by women as well, but men's and women's clubs are noticeably different. It can also be embarrassing for a male golfer to receive a woman's product. A TaylorMade SLDR Driver could be an excellent gift for a guy golfer, but not so much when it's the ladies version. In addition, keep in mind that lefties generally prefer left handed golf clubs. In this case, the gender is right, but too much so. Just because a golfer is a woman doesn't necessarily mean she'll want a pink unicorn headcover. If you want to give a woman a great golf gift, check out our 10 Holiday Golf Gifts for Women list. Golf clubs are an investment for many people. Before you buy one, be sure that it's a club that your golfer doesn't already have. This is especially important if you're planning on giving an entire club set. This is another reason why a golf club may not always make the best gift unless you're absolutely sure what the recipient has and uses. Getting a left-handed golfer a right-handed club is probably the biggest mistake. But other specifications are also easy to mix up. If you don't know whether he uses a stiff or regular flex, which degree of loft he prefers, or which length he uses, it's safer just to give a Global Golf eGift card. Giving a golfer any gift related to his sport shows thoughtfulness, but with these considerations you can give a golf gift that's more than just well-intended—it can be one that's truly treasured.